Back in September, you could have signed up for a 4 week free subscription to stamps.com and got 2,500 free Chase Ultimate Rewards points. As it turned out, Stamps.com cancelled all the accounts which signed up for the promotion (this was great, since you didn’t have to call and cancel your account after 4 weeks), but Chase honored the 2,500 Ultimate Reward promise. Emily’s Ultimate Rewards account was credited with 2,500 points in September. 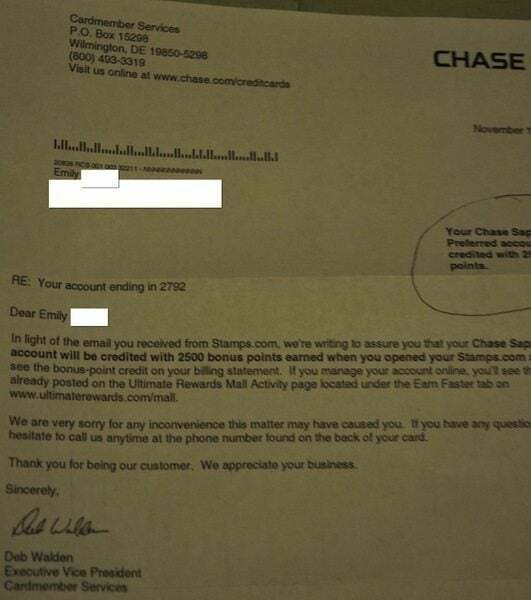 But Emily got a letter from Chase today (2 months later) assuring her that 2,500 Ultimate Rewards points would be credited to her account. 2,500 Free Ultimate Reward Points! I’m not sure why we got the letter, but it is nice to know that Chase is committed to honoring the 2,500 miles stamps.com offer which was posted on the Ultimate Rewards shopping portal. Personally, I believe that Chase is going to grab a nice piece of the premium credit card market from American Express and it is very refreshing to see such proactive customer service from Chase. Bottom Line: If you didn’t get your 2,500 free Ultimate Rewards points from the stamps.com sign-up, it doesn’t hurt to call and secure message Chase to let them know. Funny, I SM’ed them yesterday about the same thing as I didn’t see my points post..within a few hours I got a reply with 2500 more points. Awesome job Chase! @Bringer – I agree – Chase did a great job managing this promotion! I never got points for signing up for stamps.com (didn’t get a cancellation letter from stamps.com either). Sent a secure message to Chase and an hour later I have 2500 more points in my chase UR account. Sweet! @Hiker T – Congrats on the points! I suspect that going forward Chase will beat AMEX in the sign-up bonus game. Historically, AMEX has usually lower sign-up bonuses than Chase, but perhaps they will reconsider that soon. 🙂 And of course, we want to get BOTH AMEX and Chase sign-up bonuses! I jumped on it early and actually received my Stamps.com order, so I got the free postage and the 2500 points, and I received the letter as well. Concur… received points and letter. AMEX will need to do a better job (primarily with their MR Program). Same delightful letter arrived in my mailbox yesterday too. @acker – I’m guessing you got your miles earlier too, right?